You’ve probably been hearing non-stop news about the Gulf Oil spill lately, but have you seen it? A few weeks ago Google launched its crisis response site in an effort to actively inform the world on the progress of the spill. Because of pressure from congress, today you can watch the Oil Spill live as they try to fix the leak. Additionally, PBS is calling for your ideas to help stop and clean up the spill. 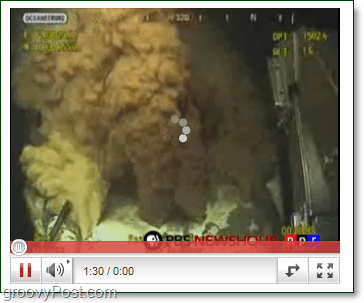 Keep the video under 60 seconds and submit it to the Gulf Coast Oil Leak Google Moderator channel. Submissions are due by 5:00 p.m. EST on Thursday, May 27. There is also an option to send a text response, but either way include your name and location. What’s your take on the Gulf Oil Spill and Google’s Support of the crisis? Post your comments below! Google is really doing a lot to show that they aren’t evil. The Google coverage of the oil spill is the most in-depth I’ve seen so far. They have done a nice job. This oil spill is going to create a lot of jobs yes, but it’s going to be the work environmental disaster in the history…. very very bad. I think some jobs will be created yes for the clean-up but don’t you think more jobs will be lost from the fishing industry and local businesses from the drop in tourism? I think overall, your right in that this is very very bad. I just hope they can get some sort of clean-up done before the hurricanes start… That could / will be disastrous. Try CCleaner. It’s not only a registry cleaner, but also removes temporary files and unneeded programs!